No, that’s not a typo, B2P – not B2B or B2C – is the future of marketing. You’ve probably heard of the phrase, “people buy from people”, and with the rise of digital marketing – especially social media – connecting directly with customers has never been so easy. The business-savvy have rapidly realised that these new lines of communication are a valuable resource on their target audience, whilst simultaneously allowing them to build trusting relationships with their customers. At RONIN, we think that it has become less important to differentiate between marketing to businesses (B2B) or consumers (B2C), and more important to focus on engaging people – enter, B2P marketing! Read on for the lowdown on what B2P marketing is, and why you need it for your business. What is B2P marketing and why is it effective? 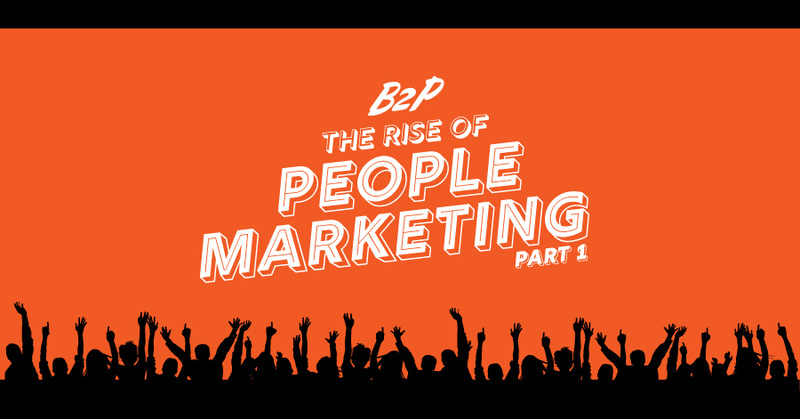 B2P is ‘business to people’ marketing and is based on the recognition that regardless of whether you are selling to an individual or company, there is always a person, or small group of people, making the decision about whether to buy your service or product. Businesses that are successfully marketing their services know that people trust people – this is why gathering reviews and testimonials has always been so important. Think about the last time that you bought something without seeking out anyone else’s opinion first? Whether through a personal referral from a friend or family member, or through checking online reviews and social media comments. Building relationships with your existing and potential customers has always been the key to selling. Although you can build the reputation of your business in its own right, it’s easier to build the trust between a business and customer when there is a recognisable ‘face’ of the brand. Case in point: Richard Branson is so much the face of Virgin, that the person and the brand are almost one and the same Whether you book a Virgin flight, sign up for a Virgin mobile contract or stay at a Virgin hotel, you’re always reminded that you’re buying directly from Branson. The Virgin Group even has an entire section of its website dedicated to stories about what he is up to. It’s worth noting he’s always referred to by his first name – a mark of familiarity that Virgin encourages consumers to also adopt. This might seem deceptively easy. It’s true that not every company has the time, resources or a charismatic figurehead to utilise in their marketing strategy. But, businesses can still benefit from their digital marketing efforts by taking a more personal approach to their online interactions by developing a strong online voice for their brand. Some large brands are doing this to great effect. The smoothie company, Innocent, appeals to its target customers by injecting tons of personality into its digital marketing. From a campaign to recruit knitters to knit hats for their smoothies, to its humorous, chatty style on social media –it live tweets The Great British Bake Off – Innocent presents a distinct personality that connects with individuals. Of course, it’s not a ‘one size fits all’ method. This style of social media would be inappropriate for a law firm – people want lawyers well versed in law, not lemon tarts! Businesses should always have their target audience in mind when deciding on an authentic online voice. When a brand lacks a ‘face’, using recognisable and trusted faces with established reputations is a clever alternative. Celebrity endorsements are nothing new in the world of marketing; for years, the fashion and beauty industries have relied on celebrities to advertise their products. So, at first glance, the recent Nike campaign featuring American football quarterback Colin Kaepernick might have seemed like nothing new. However, Kaepernick wasn’t just picked for his profile as a sportsman, but also for the political stand he took by kneeling during the national anthem at an NFL game. By featuring Kaepernick with the tagline, “Believe in something. Even if it means sacrificing everything.”, Nike appeared to be taking a political stance aligned with his personal views. It was undoubtedly a risky manoeuvre, but one that ultimately paid off for Nike, as the campaign received a record amount of engagement and garnered worldwide attention. In Part Two, we’ll reveal how technology has paved the path for business to people marketing, and how to use B2P to appeal to future generations. Need help with your marketing strategy? Contact us here. Keep up to date with us via social media: Facebook, Twitter, Instagram, & LinkedIn.